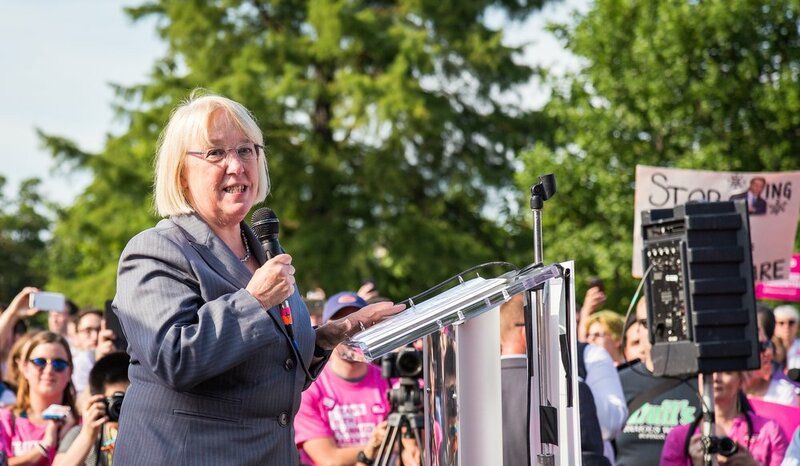 U.S. Sen. Patty Murray (D-Wash.) speaks at a rally outside the U.S. Capitol on June 28, 2017. A senior policy adviser for Murray allegedly said, “We don’t care about anti-Semitism in this office,” JNS reports. Credit: Mobilus In Mobili via Wikimedia Commons. The remarks were purportedly made in a conversation that took place between Sarah Stern, the president of the pro-Israel group Endowment for Middle East Truth (EMET), and Jake Cornett, a senior policy adviser to U.S. Sen. Patty Murray (D-Wash.), the ranking Democrat on the Senate Committee on Health, Education, Labor and Pensions (known as HELP). Stern’s organization has been urging senators to support the nomination of Kenneth L. Marcus as assistant secretary of education for civil rights. Marcus’s confirmation hearing took place last month, and a vote on the nomination will be held in the coming days. In the meeting with Cornett, at Murray’s office on Nov. 28, 2017, Stern spoke of Marcus’s work against anti-Semitism as one of the reasons that senators should support the nomination. On Wednesday, a member of the senator’s staff “had a productive conversation to clarify what [Stern] took from the meeting and to make sure she understands the office’s clear position on this issue,” according to the spokesperson. The Marcus nomination has been supported by major Jewish organizations such as the American Jewish Committee and B’nai B’rith. It is opposed by pro-Palestinian organizations, including the U.S. Campaign for Palestinian Rights and Jewish Voice for Peace. In response, supporters of Marcus point out that he and the organization he founded, the Louis D. Brandeis Center for Human Rights Under Law, pressed San Diego State University (SDSU) for action when a Muslim student was attacked there several years ago.